The Belgian brothers Jean-Pierre and Luc Dardenne are known for writing, producing and directing films that focus on working-class life in their native Belgium. The duo started with documentary films and moved into dramas shot in a naturalistic style. 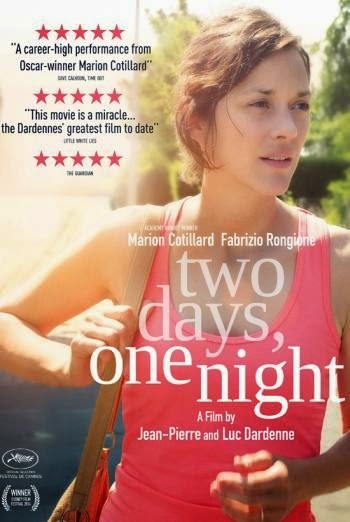 TWO DAYS, ONE NIGHT, Belgium's entry for Best Foreign Language Film in this year's Academy Awards, is the first Dardenne film to star a an “A-list” actress, Marion Cotillard, whose performance earned a nomination for Best Actress. "Hiring such a famous actress was an additional challenge for us,” said Luc of Ms. Cotillard, who adopted a Belgian accent for the role. Like all of the Dardennes' films, this one is set in Seraing, an industrial town in the French-speaking region of Belgium. Cotillard plays Sandra, a young wife and mother who learns that her colleagues at the solar-panel factory where she works have voted for her to be laid off in favor of each worker receiving a 1,000-euro bonus. Sandra, nervous and fragile, has just recovered from a serious bout of depression and was preparing to return to work. Sandra persuades her supervisor to hold another vote. Now she has only the weekend (two days, one night) to convince a majority of her fellow workers to vote for her to keep her job. One by one, she visits her colleagues and recites the same plea: “I need my job. We need my salary at home. I want to keep my job and stay off the dole.” Her task is exhausting and humiliating. Several of her workmates refuse to change their votes, saying they'd like to help but need the money. The company has created a damnable dilemma between solidarity and self-interest. Sandra is agonized by having to beg her co-workers for her job; they are forced to choose between their own needs and her livelihood. According to the Dardennes, the story was inspired by a real-life case in France, where a less productive worker was fired so other employees could get bonuses. Daunted by the task and discouraged by the many rejections, Sandra nearly gives up. Her husband Manu (Fabrizio Rongione) encourages her to keep going, and she eventually does convince a number of her colleagues to vote for her. Despite the ticking-clock tension, the film is ploddingly procedural. As Sandra knocks on door after door and recites her speech, the film takes on, as my viewing partner noted, the repetitious quality of a children's book. “Will you vote for me?” “No.” “Merci, au revoir.” “Au revoir.” Only minimal background provided about Sandra, whose fate is nonetheless meant to deeply concern us. Instead of creating a character for her, the Dardennes linger on Sandra's slumped shoulders and film every footstep she takes. Judicious editing – omitting, for instance, Sandra's many walks to the doorsteps of her colleagues — would have helped the pace considerably. Its repetitiousness and occasional missteps (such as a highly unrealistic drug-overdose episode) are small complaints about a film that, to its credit, explores issues that seem scarcely to concern many Americans in the 21st century — the power of union and the oppressiveness of capitalism, which encourages profit and self-interest above human compassion. 3 out of 4 stars.